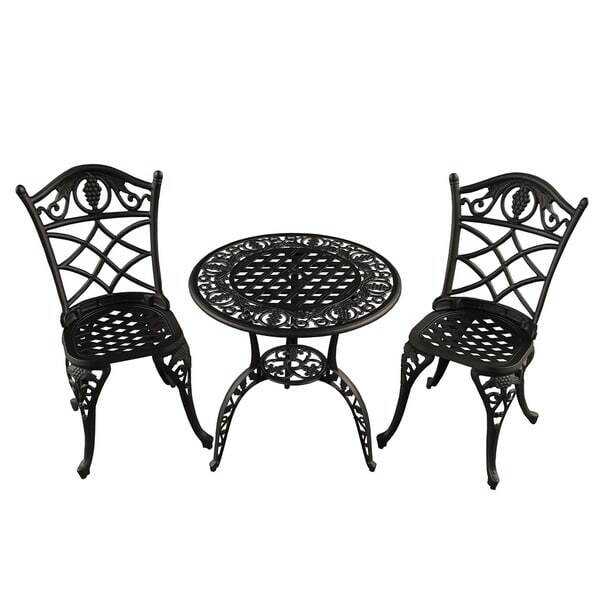 Enhance the beauty of your deck, porch, walkway, garden, balcony or patio with this handcrafted ornate traditional aluminum grape bistro patio set in black. This quality patio bistro chat set is ideal for outdoor or indoor entertaining and is designed to maintain their beauty for years to come. Each piece is covered with a textured black weather-resistant powder coated finish that also resists chipping, scratching, scuffing, and fading. Quality bolt and screws, simple design making this bistro set easy to put together and stay stable. Dimensions 26.0 In. X 26.0 In. X 26.0 In.